South Korean stocks traded lower on Monday as investor sentiment remained subdued over the lingering trade tensions between the United States and China and rising US nterest rates. 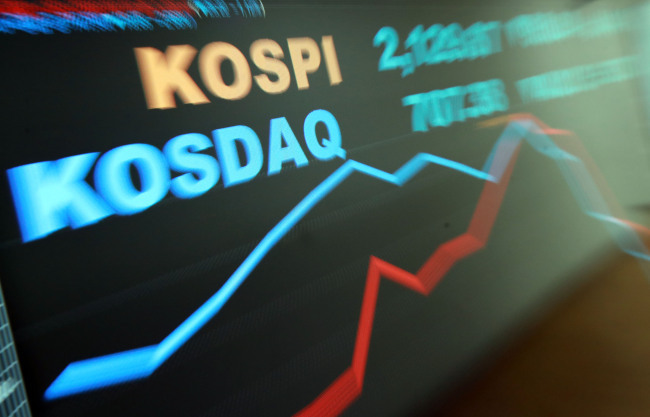 The benchmark Korea Composite Stock Price Index dropped 6.34 points, or 0.29 percent, to 2,155.51 as of 11:20 a.m.
Market heavyweights were seeing bearish trade across the board as foreigners and institutions remained net sellers of foreign stocks, following a deep loss last week. Tech shares traded in negative terrain. Top market cap Samsung Electronics slipped 0.57 percent, and SK hynix, a major chipmaker, lost 2.21 percent. Auto shares were depressed on concerns over weak earnings in the third quarter. Industry leader Hyundai Motor fell 2.6 percent, and its sister company Kia Motors tumbled 7.37 percent. Naver, the nation's top portal operator, dipped 3.87 percent, as it was expected to post downbeat third-quarter earnings.